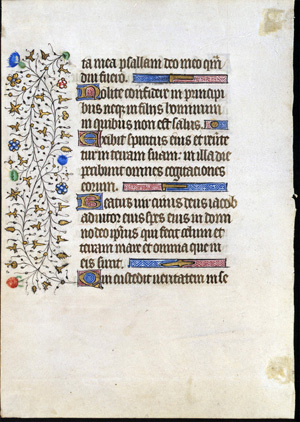 Text: This leaf contains text from the Office for the Dead at Vespers (here, Psalms 145). A scan of the recto is not currently available. Reconstruction Note! In Ege's original manuscript, this leaf (probably) followed what is now Leaf 31 in the Kenyon College portfolio (pending inspection of the Saskatchewan leaf's recto). -ta mea: psallam Deo meo quamdiu fuero. [from Psalms 145] ...in my life: I will sing to my God as long as I shall be. Put not confidence in Princes: in the children of men, in whom there is no salvation.